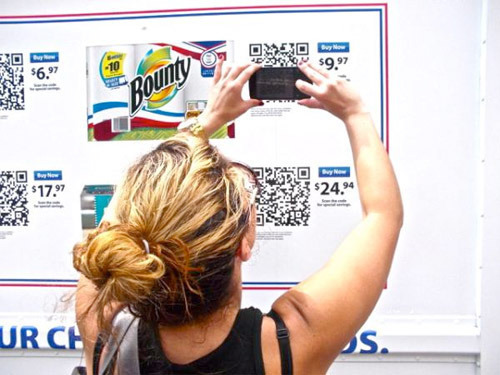 Quick Response (QR) codes continue to appear in creative and inspired marketing promotions. Companies are finding new uses for the codes, as well as new ways to display them. Here is a list of new QR code campaigns in 2012. Some of the QR examples are remarkably inventive, such as Emart’s shadow QR code. Other campaigns, like the mobile barcode campaign from the USPS, show broad practical examples of mobile commerce. Coca-Cola. To promote the 2012 Europe Cup soccer tournament, Coca-Cola placed QR codes on its containers to connect users with exclusive tournament videos and its SmileWorld social app. This video is a Spanish TV spot on the program. USPS. The USPS is currently running its second annual summer mobile barcode promotion. Mailings in July and August that contain a QR code or other mobile barcode will receive a 2 percent discount. The barcode must lead to an ecommerce or personalized website. P&G. Last month the beauty and home products giant launched PGMobile shopping trucks to patrol New York City, distributing free samples. On the side of each truck, QR codes enabled shoppers to purchase P&G products for home delivery from Walmart.com. Truck locations were tweeted by @PGMobile. Rockport. Rockport ran a promotion in New York that featured a giant box with people hanging off the edge. The event launched Rockport’s TruWALK line of running shoes. Observers could scan QR codes on the sides of the box to learn more or purchase the shoes. The Atlantic. For the magazine’s next three issues, beginning with the July/Aug issue, readers will be able to scan QR codes on select pages and access extended multimedia content, such as video interviews. To create the experience, the magazine partnered with Metaio, the company behind augmented reality app Junaio. Emart. Emart, the large discount chain in Korea, launched a lunchtime promotion where shoppers could scan a shadow QR code, using the sunlight and shadow only available between 12 PM and 1 PM. The shadow code gave shoppers access to coupons valid only for the hour. Budweiser. Budweiser launched a QR code campaign allowing beer drinkers to scan their beverage containers and track their beer’s history back to one of the 12 American Budweiser breweries. Volkswagen. Volkswagen ran a QR code campaign to promote Crafter, its line of commercial vans. The campaign features a huge QR code structure, made of orange crates. When viewers scanned the code, they were taken to a video of those orange crates fitting inside a Crafter van. Allure. The August issue of the beauty magazine is its “Free Stuff” issue. Every weekday in August, readers can enter the giveaway by scanning mobile tags in the issue. The magazine will be giving away 32,350 items valued at $690,000 in total. Sani Gourmet 2012. This year’s Sani Gourmet food festival used QR Codes to deliver information regarding the program’s organization and the chefs who take part in its celebration of gastronomy. Participants scanned codes on event brochures, menus and ads to access extended coverage of the event. Mercedes-Benz. To promote its new Mercedes A-Class, Mercedes-Benz held “the A-Class QR-Trophy” competition. Participants downloaded the contest app, and located QR codes to collect badges. Heineken. At the Heineken Open-er Music Festival in Poland, attendees were given the opportunity to create their own U-codes, which are QR code stickers that carried personal messages. The codes were a way to help people engage each other and socialize. Maserati. Maserati launched a campaign, placing QR codes in print ads. Upon scanning the codes, users were taken to a site where they could design a GranTurismo S, find the nearest dealer, and subscribe to the Maserati newsletter. Americanino. Americanino, a Chilean fashion brand, held a QR code promotion that ‘hypnotized’ teenagers and tried to get them to talk off their clothes in public. Those who did were rewarded with Americanino clothes. Converse. Converse ran a promotion with shoe retailer Journeys. Converse placed a QR code in Journeys store window as part of a “Plug Into Color” campaign to promote a line of Chuck Taylor shoes exclusively available at Journeys. Scandinavian Airlines. Scandinavian Airlines ran a QR code promotion that required two mobile devices, side by side, to scan the code in order to obtain a deal. Watch the video below to see the “2 for 1 offer it takes 2 to see” promotion.